Brrrrr! It's certainly getting chilly out there - I think it's safe to say we are officially in winter right? I'm feeling very seasonal and thought I'd change up my blog layout a bit - do you like the Christmassy theme? 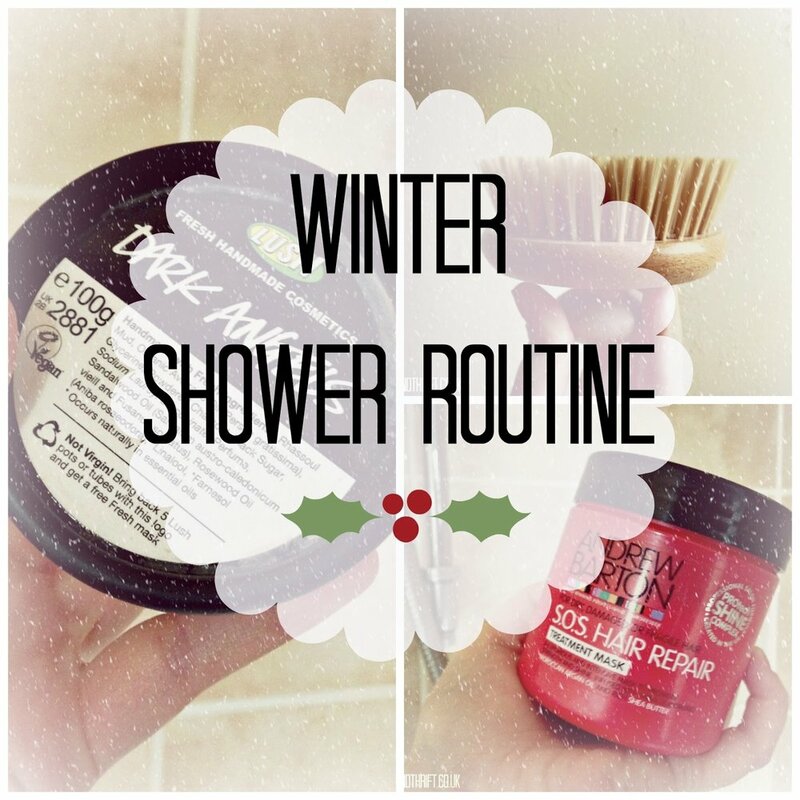 The wintery weather inspired me to do a little post about my winter shower routine! My hair and skin seem to change in this blustery weather so I have to start using different products to get the best out of them. A thing I like to do before I shower is use a body brush - this one is from the Body Shop however you can get them cheaper in places like Boots, Superdrug etc. It's a great thing to include into your routine as it really helps your circulation which is especially vital during the colder months. Body brushing is so easy - you basically brush your skin towards your heart if that makes sense? It has so many benefits including meditation and reducing celulite! First up I'm going to chat about hair. I don't know about you but I feel like you can never win with hair - in the summer its frizzy and sweaty and in the winter it's too windy to maintain a decent style! As my hair is quite thick I have to try my best to keep it falling flat - I've been using Andrew Barton's Full On Volume Shampoo and Conditioner (which is on a 'roll back' at the moment so go grab it!) to give my hair an extra boost. I have to be honest I have used better volumising shampoos (I am a huge fan of the Aussie one) however the smell of these products is amazing and they get the job done which is all I really need from a shampoo! With all the elements battling against your hair, i.e. the wind, rain, cold and extreme central heating it's easy for your ends to become dry - another product I have been using by Andrew Barton is their S.O.S. Hair Repair which I am a bigger fan of than the volumising hair care. It has a lovely smell that I can't quite put my finger on (I'm such a helpful blogger!) and it leaves your hair feeling and looking healthy. In desperate times, such as after I dye my hair, I am loving the Lush 'Damaged' Hair oil - you actually use this before your shower (about 20 mins it recommends). Okay so whilst my shampoo is on I usually get my razor and shower gel and go to town - I've been slowly getting through this huge NSPA Fresh Clementine shower gel. The smell of this is insane (again I'm a sucker for lovely smelling shower stuff) and they do loads of other flavours including my two personal favourites coconut and lemon. At the moment ASDA have got these on offer 2 for £4 and I think this is amazing value for 500ml of product. Whilst my conditioner or hair mask is soaking in I usually get my favourite body scrub to combat any dry skin I have accumulated in the freezing weather! I can probably speak for many people when I say you can't beat a Body Shop scrub! The one I'm using at the moment is the Moringa Cream Body Scrub which is an acquired smell but I've grown to love it. My faves have got to be Shea and Mango. It's also important to keep your face exfoliated in the winter! I love Lush's Dark Angels Cleanser which I often leave on like a facemask throughout my whole shower. It's a bit weird to apply because it's charcoal based and black but it leaves my skin feeling amazing - just make sure you give your bath/shower a good rinse afterwards! Do you change up your routine in the winter? Are they're any winter products that you love?